You hear it all the time. There are never enough hours in a day to do everything you want at work, at home, and in between. And yet, the time is always there. So the question really is: How will you use your time? At Salesforce, we’ve always believed the answer is that you can be more productive than you ever dreamed. The key is to find better ways to do things. That’s exactly what bringing the power of Sales Cloud Lightning to email does — it helps reps spend more time selling and less time switching between apps. I’m personally very proud to introduce Lightning for Outlook. 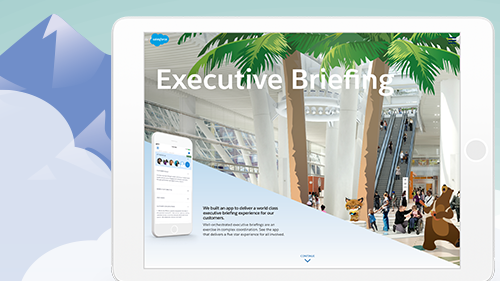 Thanks to the strategic partnership between Salesforce and Microsoft, the world’s #1 CRM meets the leading email platform, supercharging productivity for your whole sales team. Spend less time switching and more time selling. 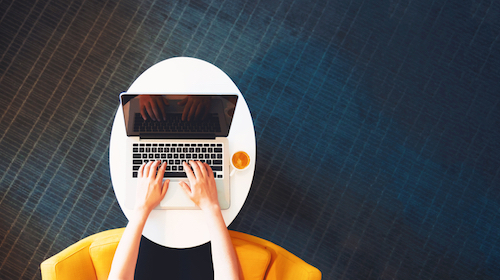 By accessing Salesforce directly from Outlook, there’s no more jumping between programs, no extra clicks, no hassle — just the modern sales workflow, the way it was meant to be. 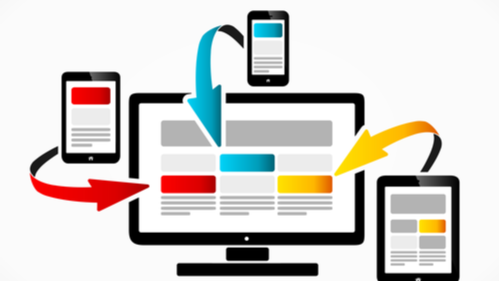 With customer data at the point of customer contact, reps can more easily stay close to their customers. They easily see whom to contact when and how to painlessly update records for seamless handoffs. Streamlining these common tasks saves more and more time — contact by contact, rep by rep, and day by day. Soon you can add custom sales apps to Outlook. But you don’t just sell faster with Sales Cloud Lightning, you sell the way you want. Soon you will be able to add custom sales apps directly into Outlook, creating permanent shortcuts everyone can use. For example, sales reps will be able to easily update a price quote using SteelBrick. This is an example of a Lightning Component, the reusable building blocks of apps you can assemble without code. Put them inside email and their time-saving power only grows. Stay on top of your schedule. Let’s solve the problem of digging around for email addresses and meetings once and for all. Lightning Sync keeps contacts and events in sync between Office 365 or Exchange accounts and Salesforce without having to manually add your calendar entries and events. With Lightning Sync, email addresses autocomplete, and your calendar is always up to date. By sharing data seamlessly in real time between your Exchange-based email systems and Salesforce, Lightning Sync makes everyone more productive. Enhance every version of Outlook. Lightning for Outlook is 100% cloud-based with all the benefits of the cloud: automatic upgrades and extremely customizable. Lightning for Outlook is available to Outlook users across Windows, Mac, and Web and is coming soon to Outlook Mobile. For detailed requirements, see FAQs below. We work together to help you get ahead. Leading companies like Accenture, BMC Software, TechBridge and Unilever already use joint solutions from Salesforce and Microsoft to reach new productivity levels every day. 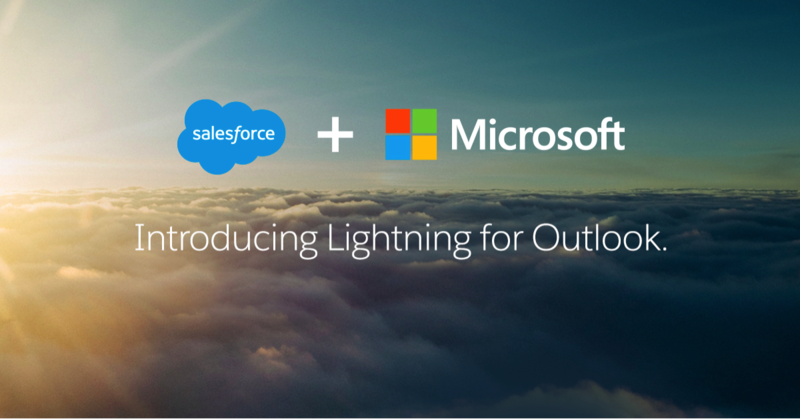 Lightning for Outlook is just the most recent solution from Salesforce and Microsoft’s strategic partnership. Stay tuned for what’s next. We’re committed to always finding better ways for everyone on your team to do what they do best. With Lightning for Outlook, you can spend less time switching between apps, logging, and searching — and more time just selling. Because with the power of Lightning inside your email, your team can reach new heights of productivity and stay there. 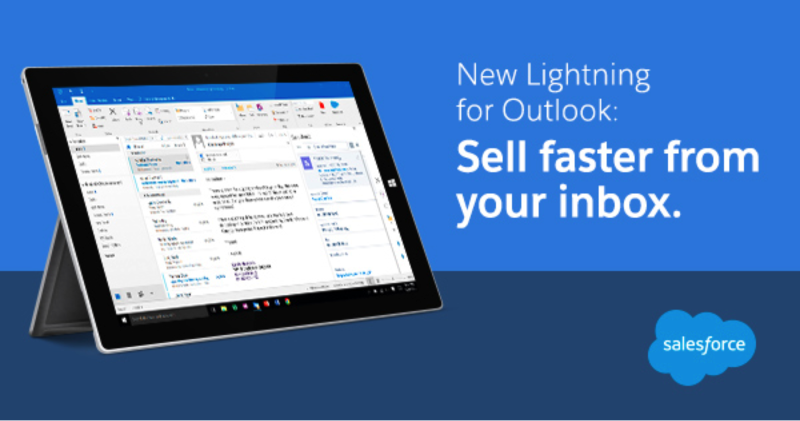 Get Lightning for Outlook now from the Office Store. Q: What versions of Exchange/Outlook does Lightning for Outlook work with? Do I require a Salesforce subscription to use it? A: To access the Salesforce Lightning for Outlook add-in, you need Outlook 2013 for Windows or Outlook 2016 for Windows/Mac or Outlook on the web with either Office 365/Exchange 2013/Exchange 2016 mailboxes. It is coming soon to Outlook Mobile. Q: Is the add-in available WW? A: Yes, the add-in is available to all Salesforce customers with the necessary licenses. Q: Is the new Lightning Experience required to use this add-in? A: No. Customers can use this add-in with Lightning Experience and Salesforce Classic.